Last week we received and installed the new Tesla Model 3 Roof Rack on our car – go check out the install if you are curious. 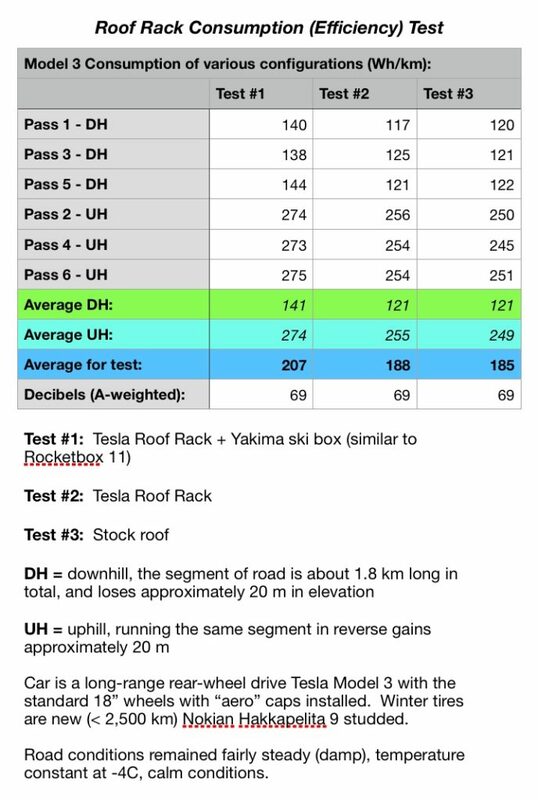 One of the comments I have been receiving and seeing online in the forums is “how does the roof rack affect your efficiency?” I decided to do a controlled test to find out! I created a test plan to help ensure I had control over as many elements as I could during the testing. Since I already had the roof rack and Yakima ski box installed, Test #1 started there! Check out the video below to see how we conducted the test, and my random thoughts that popped up during the testing process. Now that you’ve watched the video or read the test plan, you understand how we controlled the test. The results are tabulated below – bear in mind that I have winter tires on and it is cold outside, so the bare roof consumption is likely higher than what you were probably expecting… but that doesn’t matter, as what I was interested in finding out is how the consumption is increased by adding the rack, then the ski box. Looking at the consumption table for the downhill and uphill only segments – you’ll see that the difference in consumption is essentially the same as the overall difference in consumption presented in the second table. So I think I was successful at removing the element of differences in elevation from the equation. The only thing I didn’t control for that might have had some effect on the testing is whether that battery has different internal resistance at different states of charge – I don’t think it does, but if you happen to know, chime in with a comment below! 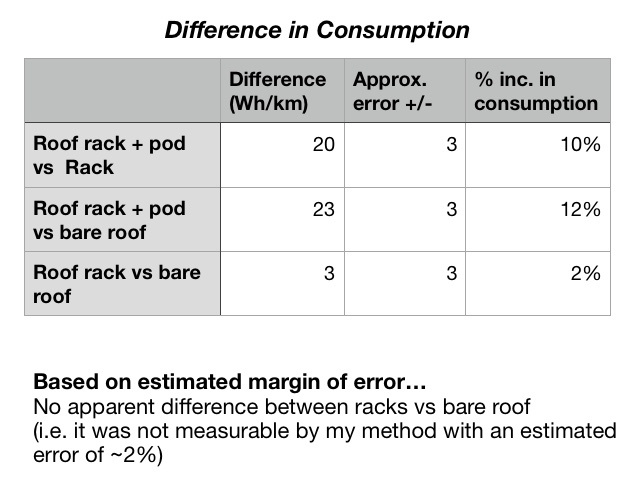 So given the approximate error in the measurement/calculations, it appears that the difference of installing the rack is negligible – a few % at worst. Adding the ski box however, that increased consumption on the order of 10 – 15%. I’m going to use 15% in my future trip planning when I use A Better Route Planner. I think the overall net benefit here is pretty clear! 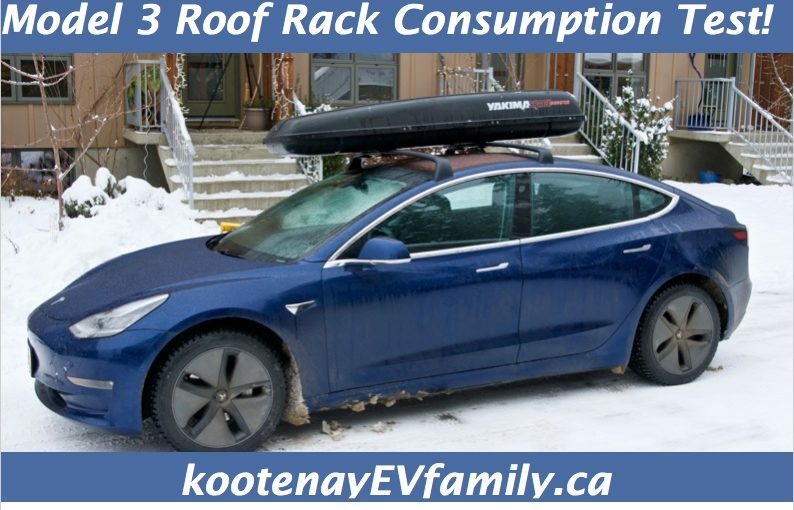 Five times more energy to move a similar sized vehicle, similar weight vehicle, with the same number of occupants and their ski gear… the Model 3 clearly wins here, even with the roof rack installed! The amount of extra energy needed to move the Forester is just atrocious. 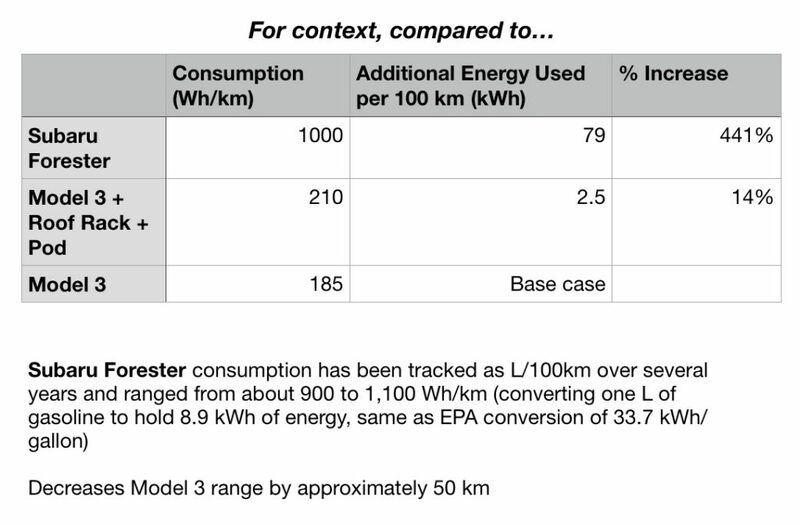 Even compared against a Prius (arguably the mainstream pinnacle of ICE efficiency), which at best has an average consumption of about 1/2 of the Subaru would still yield the Model 3 being 2.5x more efficient than the Prius! If this content has swayed you to buy a Tesla, please consider using my store referral link to order: https://ts.la/andrew71174, or give the code “andrew71174” to your Sales Advisor during your purchase. Generally you will get some kind of benefit. Nicely done on the tests! These will be useful for my decisions for sure! I wonder what the difference in range loss would be when attaching a hitch mounted cargo box instead of a roof box. May be a bit less of a range hit? I imagine it would be less since the air speed is lower in that region. However I don’t have a cargo box so can’t test it yet. Maybe I can find someone to lend me one in the late spring, once I have my receiver installed. I will be doing a similar test with my hitch mounted bike rack. Link to my video on the impact of roof racks on aerodynamics. In this instance it moved the CD of the Tesla from 0.23 to 0.28 making it as bad as a Nissan Leaf. Comparisons to Subaru Forrester are just not Germain to this project and have no bearing on the negative aerodynamic effects of carrying loads on the roof of any car. A environmental specialist would know this. Hi John, I watched the whole video – good explanation of Cd and it’s relationship to range. We will have to respect each other’s opinion with regards to the roof rack + cargo box vs bare roof. If I had not been able to mount a box, I would not have bought a 3 – simple as that. The point of comparing to the Subaru is to show the huge net benefit by switching to a 3. – if one accepts that some people do in fact need a roof box (at least sometimes), then perhaps someone should put some effort into designing one with better aerodynamics – perhaps a better profile on the rear of the box, a focus on less protruding lips, etc. I did see an interesting feature on a Yakima box recently with what they call “Carbonite” texture – it has the small dimples on most of the box that one would find on a golf ball! I’m curious to see what difference that makes. – lastly, when on road trips where the range between charges really counts, I will do what I did in my Leaf when using the heat in the winter; I’ll just slow down by 5 – 10 km/h, which will overcome most of the decrease in efficiency. Here’s a nerdy question for you – do you know how much the front of your cargo box ‘overhangs’ from the front bar? It’s hard to tell from the photos how much of the box is actually over the windshield. I figure measurement from the front of the front bar to the front of the actual box would answer that one. How much do you notice it from the drivers seat? Also, are the roof bars sans box very noisy once installed? Sorry for all the questions, but there aren’t many 3’s with boxes in the wild yet, and I’m looking to use one with my 3 Performance. Thanks!! Ok got a chance to measure it tonight – the front of the box is 26.5″ from the leading edge of the front bar, which itself is right at the seem for the front windshield (ie the very front of the glass roof, the rack feet rest near the portion where the ‘A’ pillar meets the roof etc – structural integrity I believe. Further, the rear of the pod is 30.5″ back from the trailing edge of the rear bar. Total length of my pod is 89″. I’ve added some more photos to the main post on the “install” – head over there to see more. Cheers! From the driver’s side you can’t see the pod sticking out the front really; you do notice it when you look up through the roof. The passenger can’t see it out the front either, unless they have the seat really low and are short. But, it is quite prominent when the passenger looks up! They get a great view out overtop of the passenger of passing trees and mountains, but nothing directly overhead. In terms of noise, my recollection is that you can’t really hear the bars at all, it is when the pod is mounted that you hear it. Now I only tested this at 100km/h, so it might be different if you are going faster. I also tested with my winter tires mounted, which themselves are quite noisy. I’m planning to do the consumption test again in the spring or summer with my all seasons mounted – I’ll also check the noise again, and hopefully do the test at higher speeds as well. This is great information, Andrew. Thanks for taking the time! Off topic but I didn’t know where to ask: Did you buy EAP/FSD… if not, are you planning to before Monday at the current discount? I am struggling with this decision. I did get AP and feel that has already shown to be worth it. FSD? I am not sure? But will I regret it on Monday when the discounted rate disappears? I could never afford it at the full post-delivery price of $9200 CDN. Hi Colin, I think it really depends where you live. For where I live, in the mountains with twisty roads and no “freeway” type driving, the Autosteer and Traffic Aware Cruise Control are next to useless right now (check out my video of driving my Nissan Leaf to work; scrub through it to see the type of road). I did test it during the “trial” period when it got pushed to my car. I’m going to wait until it can fully drive my car for me without any intervention needed – my personal opinion is that the in-between stages are too dangerous – humans aren’t capable of remaining situationally-aware when the autopilot is good enough to allow them to tune out, but if it makes a mistake, the human can’t react fast enough (i.e. right now to use Autopilot safely, particularly on roads like where I live, you need to be paying just as much attention as when driving yourself… perhaps more, because I found myself guarding against the car doing things unexpected – like taking left turn lanes). Perhaps if I lived somewhere with freeways and traffic to deal with, I would find the current stage of Autopilot useful, because it does seem to handle that type of driving very well! Good luck in your decision. Great insights and I agree with your rationale. As I was typing this reply (the first time) Elon Musk replied to my Twitter “tweet” and my phone went crazy. Anyways, that has died down now – back to normal. I think I am going to pull the trigger on FSD because I do live in a place where I could take advantage of it everyday – even moreso with the upcoming (expected) additions to it. But I do agree that I don’t think there should be this grey area where the car is self driving but the human must monitor 100%. For me though, I am excited to try this new technology, but am also very realistic in knowing that I have to watch carefully. I’d be happy to hear how it works out over the next year – what type of roads are you typically driving? Previous Previous post: Roof Rack!